Recent updates highlighted in yellow. The Thomas Fire has burned 281,893 acres was declared 100% contained on Friday, January 12, 2018. 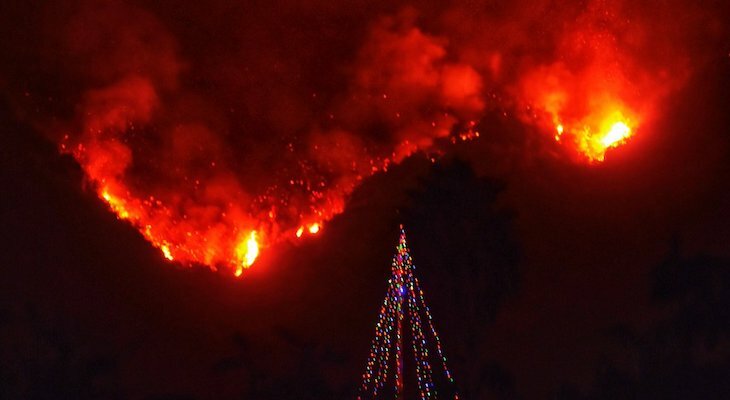 After the over flights yesterday, the Thomas Fire is now at 100% containment. The forest closures within the footprint of the Thomas Fire remain in effect until further assessments can be made and deemed safe for the public to re-enter. 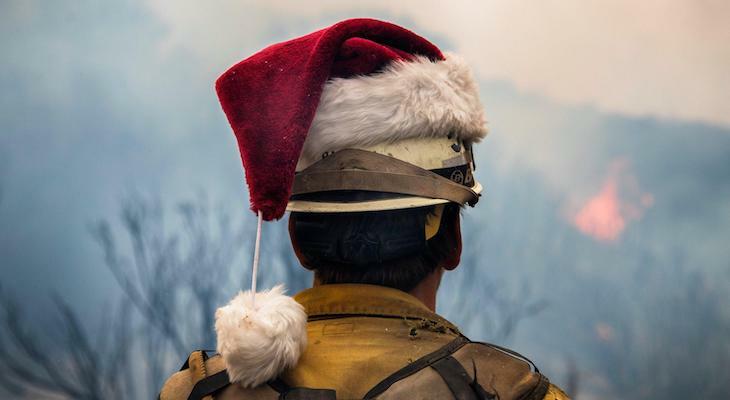 Los Padres National Forest would like to thank all the first responders and cooperators that responded to this incident over the last month and giving up the opportunity to spend the holidays with their families and the sacrifices they made. We would also like to thank the local and surrounding communities for their understanding and support during this time. Wildfires exacerbate the potential for debris flow and are most likely to occur during high intensity rainfall. Debris flows can be extremely dangerous. There is currently a closure order that covers the burned area and surrounding areas as well. This order includes trails within the burned area. Please adhere to the closure order and stay out of the forest until Los Padres National Forest deems it safe for the public to reenter the area. Also, please be mindful of any notices and warnings put out by our cooperators, Santa Barbara Office of Emergency Services and Ventura County Office of Emergency Management. The type 3 organization, under the command of Incident Commander, David Valencia, will be transferring command to a Los Padres National Forest type 4 team, under the command of Hector Medrano, effective Monday, January 8, 2018 at 6:00 p.m.
Due to the incoming weather the public will see an increase in heavy equipment on HWY 154, 33 & 101 as resources from the Thomas Fire move from the Ojai Ranger District to the Santa Barbara Ranger District. 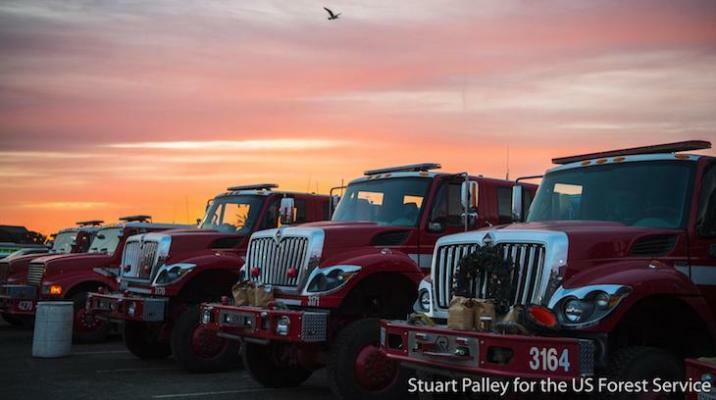 This in an effort to demobilize the majority of the resources assigned to the Thomas Fire before the weather system arrives on Monday. Once this system has passed and clear skies return, personnel from the Thomas Fire will assess the fire area to determine when it will be safe to move equipment and crews back into the fire perimeter. The type 3 Incident Management Team and the US Forest Service would like to remind the public to drive safe and be aware of the increase in heavy equipment that will be on the roads over the weekend. 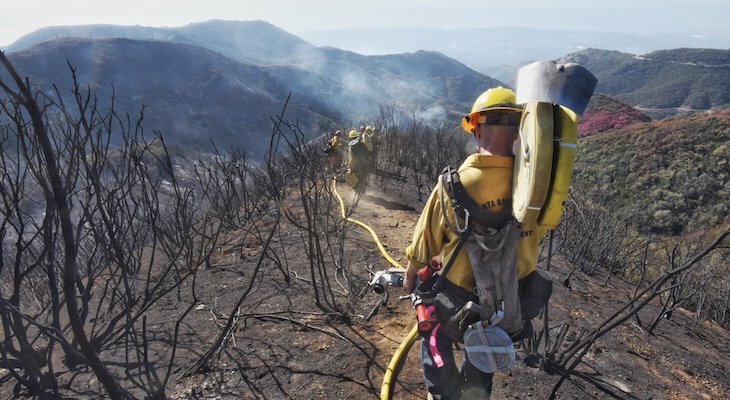 Firefighter and public safety are always the top priority of the US Forest Service and Los Padres National Forest. The Los Padres National Forest is closed to the public within the Thomas Fire perimeter on the Santa Barbara and Ojai Ranger Districts. The Sage Hill Group Campground is temporarily closed while fire crews use the area as a base camp. Level 3 fire restrictions are in effect for the Los Padres National Forest. Campfires are allowed only in designated-use sites, and no fires are allowed in the backcountry; portable stoves and lanterns (with an on-off switch) are only permitted with a valid California Campfire Permit. The federal Burn Area Emergency Response (BAER) team and California Watershed Emergency Response Team (WERT) are assessing areas within the Thomas Fire for burn severity and identifying locations at risk for flooding, debris flows and other post-fire hazards. 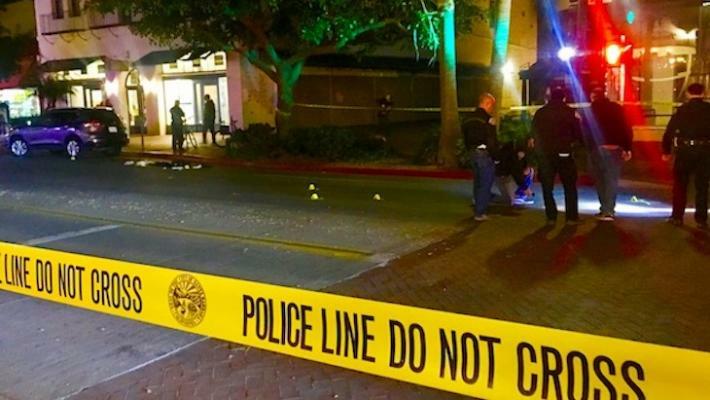 The teams will turn over their data to Santa Barbara County Office of Emergency Management and Ventura County Office of Emergency Services, who will develop emergency preparedness and response plans for their respective communities. County-based emergency service agencies are reviewing assessment reports from the BAER and WERT teams and working on emergency preparation plans for affected communities. After a wildfire, flood risk is usually highest until vegetation returns, which can take up to five years. Flood preparation information is available at www.countyofsb.org/pwd/floodprep.sbc for Santa Barbara County and www.venturacountyrecovers.org for Ventura County. 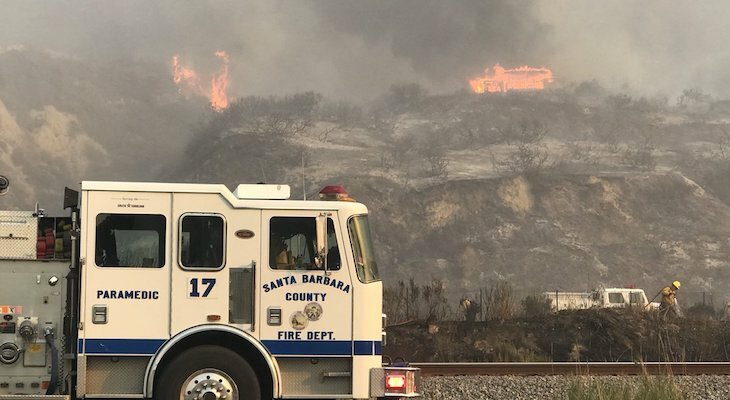 Residents and visitors to Santa Barbara and Ventura counties may see an increase in wildlife in local communities due to displacement from the fire. Individuals who encounter these displaced animals are encouraged to maintain a safe distance, refrain from feeding them, and if a threat to humans is perceived call 911 (https://www.wildlife.ca.gov/living-with-wildlife). For questions, please call the Thomas Fire Information Help Line at 681-5542. Download the revised the Los Padres National Forest’s Thomas Fire closure order and map. Temporary closure of the East Camino Cielo from the San Marcos Station to Gibraltar Road from 7:30 to 9 a.m. and 3:30-7 p.m. daily. Closures: Download the revised closure order and map. 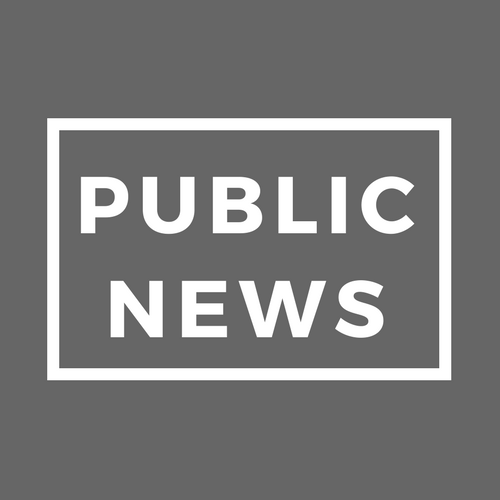 *Fatalities: A 70-year-old Santa Paula Woman reportedly died after crashing her car in an attempt to evacuate, read more here. On Dec. 14th, a firefighter was killed while working on the Thomas Fire. Read more here. **Injuries: A firefighter from Redding suffered a leg injury on December 10, and two other firefighters were injured on December 17. Read more here. State of Emergency: Governor Brown declared a state of emergency in Santa Barbara County due to the Thomas fire. 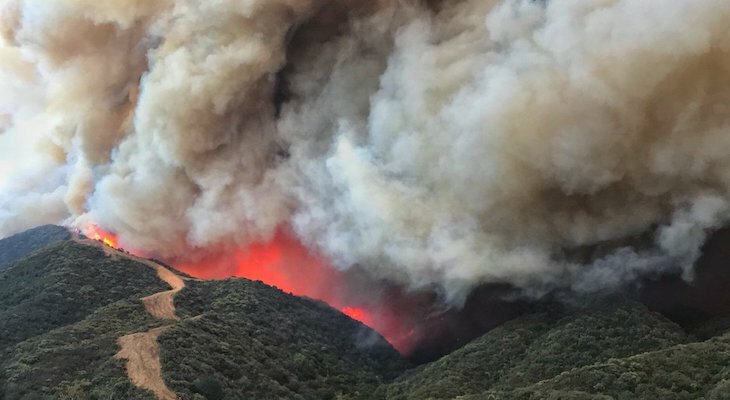 In addition, Santa Barbara County was issued a Fire Management Assistance Grant (FMAG) from the Federal Emergency Management Agency (FEMA) to assist with the mitigation, management, and control of the Thomas Fire. Read more here. Text UWVC to 41444 and 100% of the donations will go directly to those affected by the fires. For the "I Want To Support" choice, choose "Your local Red Cross." How is this fire not out after that rain??? 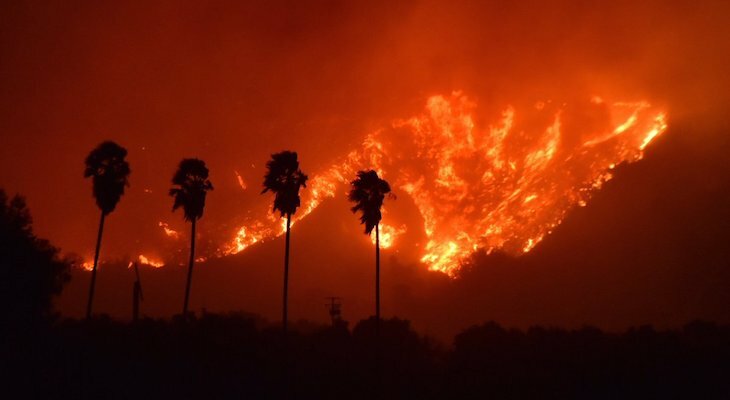 I don't understand this sentence: "Wildfires exacerbate the potential for debris flow and are most likely to occur during high intensity rainfall." Am I missing something? Yes Sundance, the rain today should give the firefighters almost 100% containment, if not fully put out by the rain I’d be amazed! The rain today must’ve helped, right?? I flew over the TFR (safely above the fire area) for an hour this afternoon and got a LOT of pix, some wide and some zoom. I've sent one to Ed, started posting more on SBitZ.NET, and will start posting more there in a couple of hours. Some interesting details, and a good look at the Southern edge from Gibraltar to Carp. 661 pix in all, though many are duplicates in case of motion blur. edhat staff, For the last few days your posted Thomas fire stats have listed "Citizens Evacuated: 10" Would you correct that typo please? How are evacuation zones numbered? Is it the same all the time, or are numbers assigned for each fire? For instance, what zone would San Marcos High School be in during the Thomas Fire? 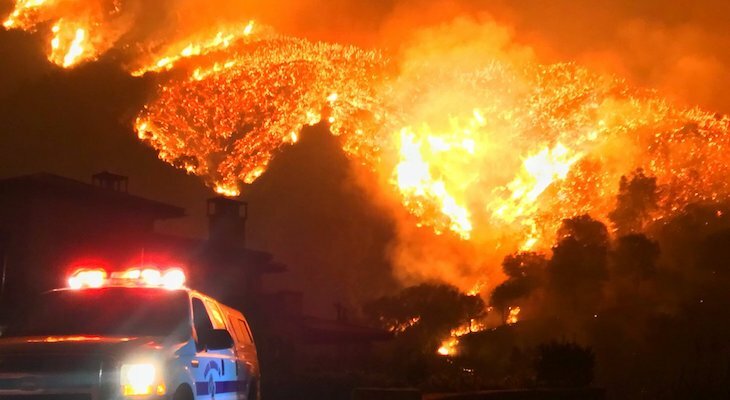 The Thomas Fire is a fire of epic and historical size, in terms of the size and duration of the fire, and the number of assigned firefighting personnel. When it rains and when the wind stops is beyond human control, but must it burn until sometime in January? Daniel Rumsfeld once said " you go to battle with the army you have, not the army you might want or wish to have at a later time." 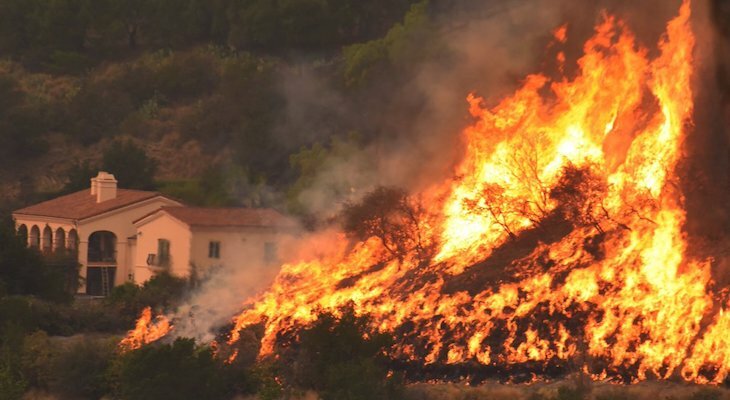 If fire officials requested more Very Large Air Tankers, more helicopters, and fresh firefighters, would that enable the Thomas Fire to be controlled sooner? "... but must it burn until sometime in January? " Yes. Yes, that was answered at one of the briefings. Believe it or not there is a limit as to how much to spend as far as what is really needed. 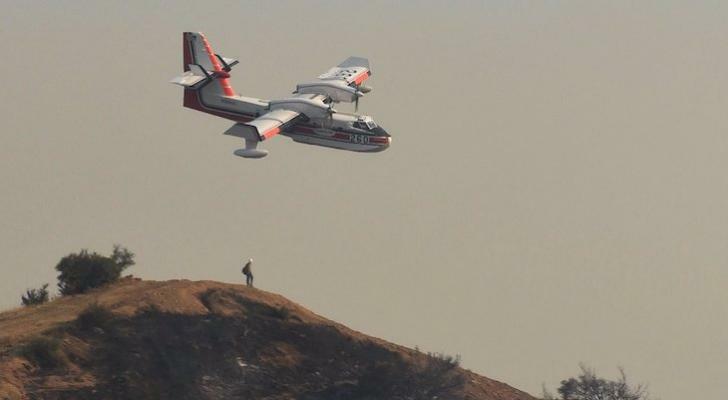 They have all they need for structure protection and spending for additional air support to sit most of the time due to weather (smoke and winds) would totally not be cost effective for what is burning in the forest and will tie into previous burns. Nothing to joke about here! Good work Ed Hat team! Usually I just write sarcastic attempts at humor (often about loser mug shots etc.) but I just want to commend the website. Good Job!!! Make this a time to reflect, and consider not being a troll in the future. Just saw a fixed wing fire bomber attack from the north towards Monticito. Could it be Oprah's private air force? Thanks for the amazing updates edhat! You've been the 1st with a lot of this info, much appreciated. Oprah doesn't need anything, she has acres upon acres of lush green landscaping around her properties. Crap! 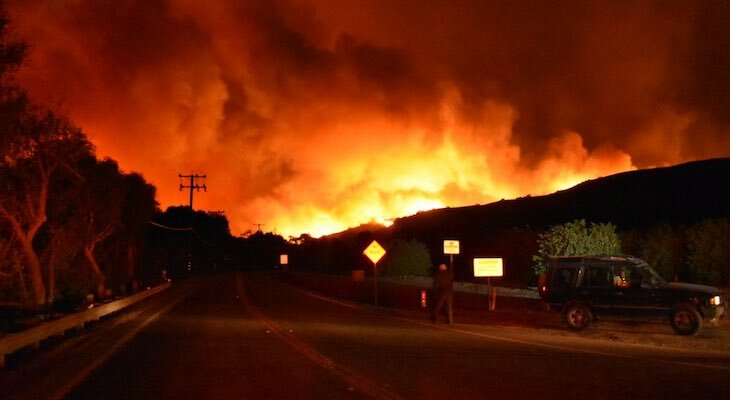 New Mandatory evacuations all the way to SR-154. Get out now people! Aerial pix & vid on SBitZ.NET from our flight over the fire just before sunset on are gradually appearing. It's so beautifully horrible looking up there! I'm hoping the pix/vids may be helpful for people wanting to get a visual on it. 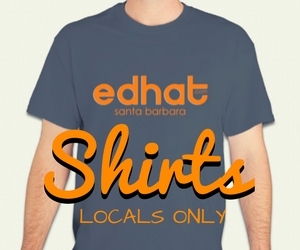 Thanks for the reporting, info and links here on Edhat! Hope everyone's safe tonight, and that we wake to better news. Just look at the above PIO map. The black perimeter lines are the containment lines and the only containment in SB Co. up to date is along the coast near the county line. Have they broken down the containment figures with the 35% update? The reason I ask is it can be misleading i.e. when they were reporting 25%, 15% was along the coastline and 10% near Fillmore/Santa Paula. It can give SB a false sense of security . Sent Ed a new aerial, more: SBitZ.NET. 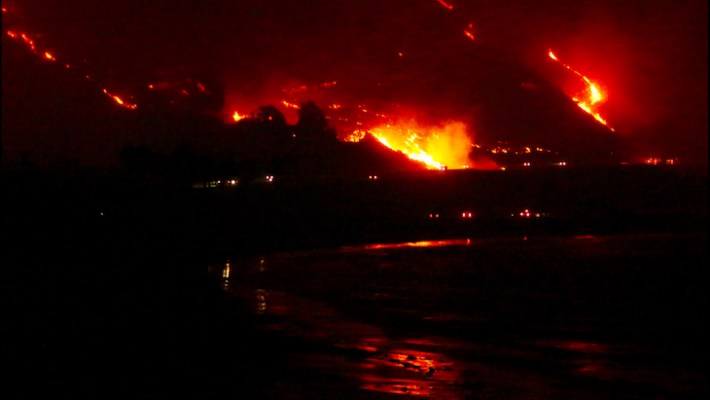 The 6pm aerial pic of the fire I emailed Ed shows where it's burning in on the mountain. Most pix from the flight are blurry but that's the first good one I found so I sent it asap. I've found more with interesting details that I'm posting on SBitZ.NET with more to come. In addition to putting the locations of active flames in better context for me, some of the pix are quite beautiful including the glow of moonrise over the horizon that the low-light camera saw when all was black to our eyes. It surprised me to see that, because the moon doesn't rise at ground level until well after 6pm. John, where are the photos? I have looked everywhere, and can't find them! Id love to see them! John - Great shots and info! However, that's more likely a light dome from light pollution than moonlight, since moonrise isn't until 0336. Family member reporting that power and verizon is down in Solvang. Anyone wil an idea about how to find out when it will be back up? The word is "perimeter". "parameter" means something quite different. Gotta love the sociopaths who downvote simple statements of fact. MATTY, In the 1960s I lived on East Valley Road and didn't know it was 192, don't recall signs. DUCKY, you are likely right about East Valley, after all there is no West Valley. Anyone have information on the 5 hot spots shown in Montecito on the nwcg map? 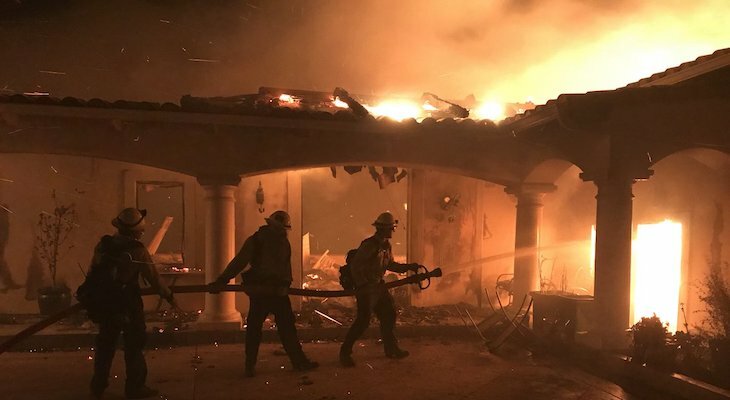 https://maps.nwcg.gov/sa/#/%3F/34.4368/-119.5954/13 They are orange now, but I have not heard any news coverage of the fire touching down in Montecito neighborhoods. Seana - Those are noise in the VIIRS satellite readings. It's so sensitive, it sometimes IDs instrumental noise as a spot fire. 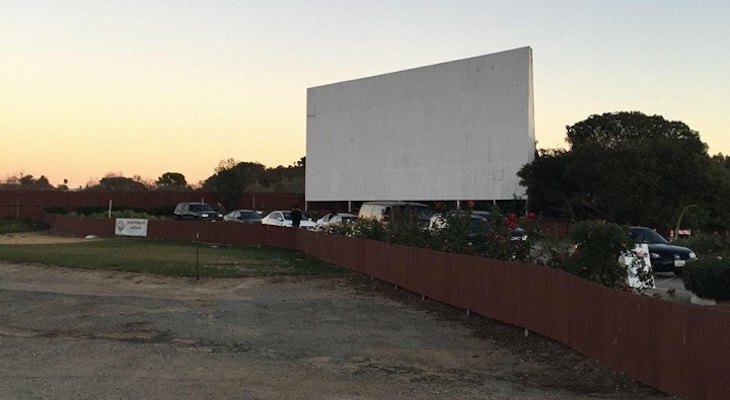 Someone at the 4 PM briefing at SMHS asked about those same 5 spots. I heard them talking about Toro Canyon earlier on the scanner I believe that is where the flare ups were Jim was telling me KEYT was running constant reports on it on a digital station but I really cannot figure out what he was talking about how to access it...He said they said it was calmed down the winds are calm and there are two choppers flying tonight in case of flare ups...That is all I know. Lots of lovely maps with lovely colors but no key to what they mean. Pink evac? Active fire? pretty but relatively useless! Just click on any of the maps shown to get a full version that includes the legends and keys. Click on that little box with an arrow on the left side of the title bar, and it brings up the legend. "MANDATORY EVACUATIONS AT SR-154" seems to be an incorrect headline at this time. It's voluntary at 154, no? Also, "effective 6:30 p.m. on Sunday, December 11" is an error. Please check the accuracy before posting so we're not guessing what to trust. Voluntary evacuation warning now extended to 154 from Foothill to E Camino Cielo! 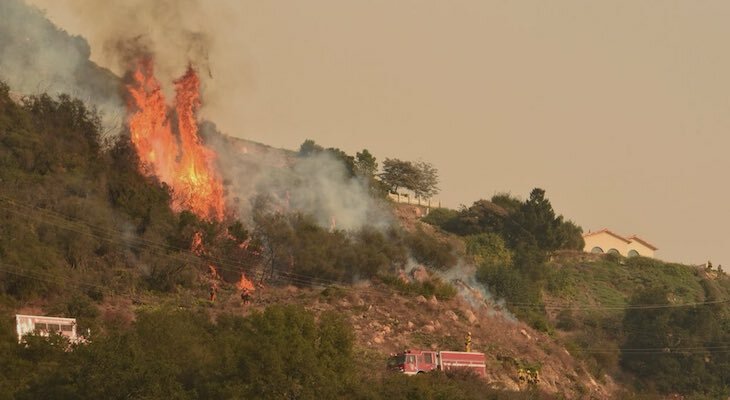 A link I've been using is this: http://wildfiretoday.com They are covering the Thomas Fire with a lot of details. Please, does anyone know where we can find an UPDATED map of the fire activity & evacuation areas with STREET level? Someone posted one the other day, but I can't find one now. Thank you! Thx. Been looking at the website, but couldn't find street level... found that I could toggle to it on the Google map.